I visited the USSR in 1988 as part of a modern studies high school trip to Moscow and Leningrad (now St Petersburg). You can see the photos from my trip on Flickr. In late 1987 I started a short course to learn some Russian phrases. I didn’t get much further than Что это (what is it?) and это стол и стул (it’s a table and chair) before I gave up. Still, at least learning the Cyrillic alphabet helped me read signs as we travelled around this other-worldly country that was then still behind the Iron Curtain. Since then, however, I have always wanted to complete the course and learn Russian for nothing other than the academic satisfaction. Plus, obviously, if Russia is to continue to interfere in national politics and influence elections it would be useful to be able to communicate with our eventual overlords in their own tongue. Thirty years on and I still haven’t learned the language. Which is why, last week I decided that now was the right time. I realised that there would never be a perfect time. I would never have a free six months to devote to the task. If I wanted to do it then I would just have to start now and squeeze it into my daily schedule—five minutes here, ten minutes there. Why did I give up so easily? But why did I give up so soon after starting to learn? There are likely to be a few practical reasons, not least energy levels, volume of school work, and family dynamics (my dad was suffering from brain damage by that point). Surely, it can’t all have come down to time or motivation. Back in 1987/1988 I had all the time in the world—besides school I had few other commitments. And I had the motivation—I would be visiting Russia during the Easter break in April 1988. But I still gave up. Why? This puzzled me for a long time, until I found the answer in a couple of books about parenting. I think the problem was that for as long as I remember I had been told that I was clever, and learning Russian is hard—I gave up, I reckon, because it challenged my self-perception as a clever boy. This isn’t as daft an idea as it sounds. In Professor Richard Wiseman’s book 59 seconds: think a little, change a lot (Macmillan, 2009) he explains why “telling a child that they are bright and talented is a terrible thing to do” (p.281). During the late 1990s a couple of psychologists (Claudia Mueller and Carol Dweck) from Columbia University, New York ran a series of experiments with children, during which one group of children were praised for being clever while the other group was praised for the effort they put in (regardless of whether they got the answers right or wrong). What they discovered was that children who were told they were really bright after completing one set of tasks were then less likely to exert themselves when presented with a choice of further tasks. While the children who had been praised for the effort they put in during the first task were far more likely to opt for a more difficult second task. Telling a child they are intelligent might make them feel good, but [it] can also induce a fear of failure, causing the child to avoid challenging situations because they might look bad if they are not successful. In addition, telling a child they are intelligent suggests they do not need to work hard to perform well. Because of this, children may be less motivated to make the required effort and be more likely to fail. Po Bronson and Ashley Merryman go into more depth about this research in their book Nurture shock: Why everything we think about raising our children is wrong (Ebury Press, 2009). It turns out that children who are frequently praised tend to become more competitive and more interested in belittling others. Their primary interest becomes image-maintenance—having been told they are clever, they want to continue to be seen to be clever even if that means pulling others down around them. Looking back at my childhood and teenage years, I don’t recognise that last aspect of tearing others down but I wholeheartedly recognise the image-maintenance part—I would joke years later that I simply dropped those subjects that I didn’t do well in, not realising at the time that I did this because they clashed with the self-image that I had been developing and which was being built-up by folks telling me that I was clever. I liked being clever. I didn’t like doing things that didn’t make me feel clever. It makes perfect sense. But I wonder what I missed in giving up things too soon. I wonder what would have happened if instead I had been praised for my effort and dug in deep at times. How can students succeed if they are not taught to fail? While I was working as the warden in a university halls of residence, I would frequently have conversations with students about the importance of failure. Here we had, arguably, some of the brightest young people in the country who had progressed from success to success to become, in many cases, the brightest in their school. And then when they arrived at St Andrews among other similar youngsters they found themselves to be decidedly average. That took them quite by surprise. And coupled with a different style of learning at university and an increased workload many found themselves not hitting their usual 100% expectations. To many it felt like the sky was falling in: their world was collapsing and their self-image was being shaken at a fundamental level. In my first year at St Andrews, I would tell them, I failed two-thirds of my course. Two-thirds! I passed divinity but failed Old Testament and ecclesiastical history; I managed to progress to second year by the skin of my teeth. But that experience changed me—it helped me to understand how I work best. It helped me to understand what works for me, and what doesn’t. In the end, I graduated with a 2:1 honours degree that I was delighted with. In recent years there seems to be an accepted fallacy that learning happens in a linear fashion, with educators setting up opportunities for children to jump from success to success without ever encountering failure. However, if this is the case, to what extent are your pupils simply working as opposed to learning? Provide the children with the toolkit to cope with failure. Praise the children’s best efforts and show them how to move their learning forward. Develop an ethos where the children are not afraid to fail and develop strategies to overcome challenge. Don’t hide mistakes from children. Adults make mistakes all the time, but children seldom are afforded the opportunity of witnessing this. Make teaching points of your mistakes and model how to deal appropriately with failure. Pupils should have the confidence to attempt new activities in a safe and secure environment knowing that failure will be met with encouragement and support. Failure isn’t something to be feared, but rather is part of the learning process which should be embraced. Children need to know that it is okay to fail and it is the trying again that is important, this is how children succeed. But it’s not just children and university students who need to learn the importance of failure. 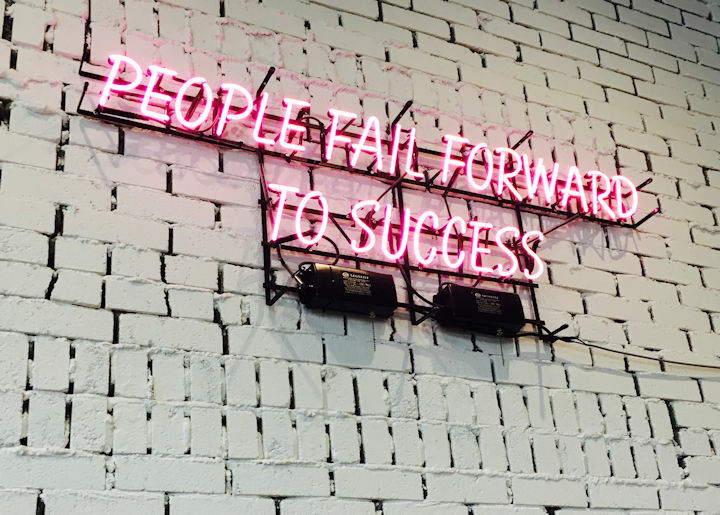 For the last few years I was working as an agile project manger in a web development team—”fail fast” is something we used to advertise as one of the benefits of working in an agile manner. 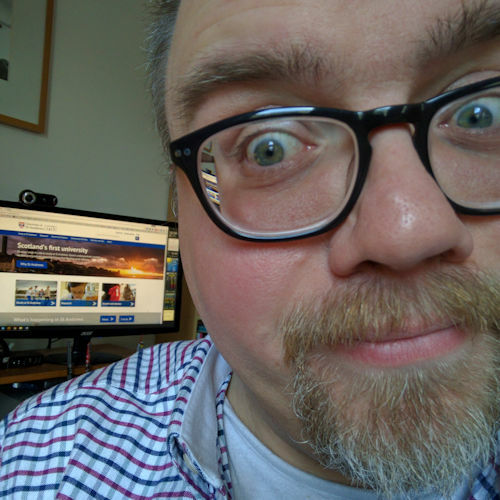 I’m delighted to see Karl Scotland (from whose writings I have learned a lot over the years) is running a session at this week’s Lean Agile Scotland event in Edinburgh entitled “Failure is not an option”. That’s right, failure is not an option—it is a necessity. I really like that quotation: don’t bury your failures, let them inspire you. There is something here to inspire me as I try to remember what этот (this), он (he), она (she) and оно (it) mean in Russian; as I try to encourage Joshua to do his French horn practice—”you’re trying really hard to play the right notes, well done” rather than “you’re so good at that”; and as I reflect on my last twenty years of work and try to make sense of what my strengths are, what weaknesses I need to work on and where I should put my energy next.